The other day, I felt like I had washed my face for the very first time! 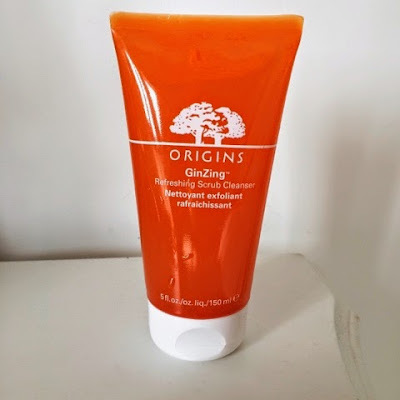 Of course this isn’t true, but after using Ginzing Refreshing Face Scrub by Origins, I felt like a born again face washer! Looking in the mirror after a couple of uses I could not only feel, but see the difference. My face looked so incredibly bright, and smooth, I actually became worried about what was doing before this product came into my life. Ginzing Refreshing scrub cleanser is a two-in-one cleanser that also exfoliates to “wake up” tired skin. The natural exfoliating scrubbing beads do what most exfoliators do which is remove dirt, debris and dead skin cells, boosting cell turnover to reveal vibrant, glowing, and radiant skin. What is a little different about this product compared to your average exfoliator, is its ingredients. Panax Ginseng and Caffeine – to optimise cellular energy in stressed skin and eliminate signs of fatigue. Jojoba and Carnauba Beads – to gently exfoliate and refine skin’s texture to reveal smooth skin and unclog pores. The Grapefruit, Lemon and Spearmint Essential Oil awaken and revitalise the senses to encourage energy. I personally wouldn’t use something so perfumed on my face (prefer it for body products) but it really does smell amazing without being overbearing. The Lemon Oil in particular is said to dispel mental fatigue and increases concentration and awareness. Just what I need… however, I don’t really think a face wash could perform such miracles, but it does smell and feel refreshing, reminding me that summer is around the corner. Just a little warning before you go out and buy Ginzing – I got over excited about this product and started using it twice a day, however, after a couple of weeks it started to irritate my skin. I have now reduced my usage to 3 or 4 times a week despite it being recommended for every day use. See how you go, but I wouldn’t use it every day.